Large cooking spoons are must have kitchen utensils! We prefer using these large plastic cooking spoons because of their one piece construction. Metal spoons with wood or plastic handles have a tendency to get food caught in the joint between the metal and handles; this cannot happen with these one piece molded spoons. The black spoon is for heavy duty cooking and mixing of stiff ingredients. 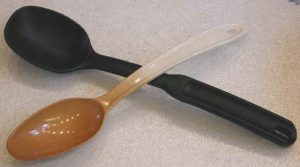 The lighter duty cream colored spoon (stained from cooking curries) is good for rice and other soft and loose preparations.